Thanks to our increasing addiction to smartphones, businesses have more access than ever before to their customers. And yet, despite the opportunity to develop more sophisticated relationships with consumers, most business owners are flailing around, disappointing potential customers. Here’s the upside: As an entrepreneur, if you can master your consumer relationships, you are very likely going to step out in front of your competition. A new survey shows that U.S. consumers today are more demanding, less forgiving and more willing to write a negative review online about their disappointing experiences with businesses. The report, which was conducted by customer experience software provider Thunderhead.com, surveyed 2,000 customers and 33 senior marketing executives. More than 8 in 10 respondents say they are being treated with a “one-size-fits all” messaging system from brands -- and it's not appreciated. Recycled one-liners don't work in love, nor do they work in business. “Receiving information that is inaccurately targeted or inappropriate for the customer’s individual context (such as offers of joint bank account for individuals that are single, or sales calls shortly after a customer complaint) is a common bugbear,” the report says. And when customers are annoyed, they are more trigger happy, willing to jump online and air their grievances in public, the report found. Three in 10 survey respondents said they would talk online, in person and on the phone with an average of 25 people after a negative relationship. “The online world means that what were once isolated incidents can become public issues with dire consequences for a brand’s value or which precipitate wide-scale customer defection,” the report says. 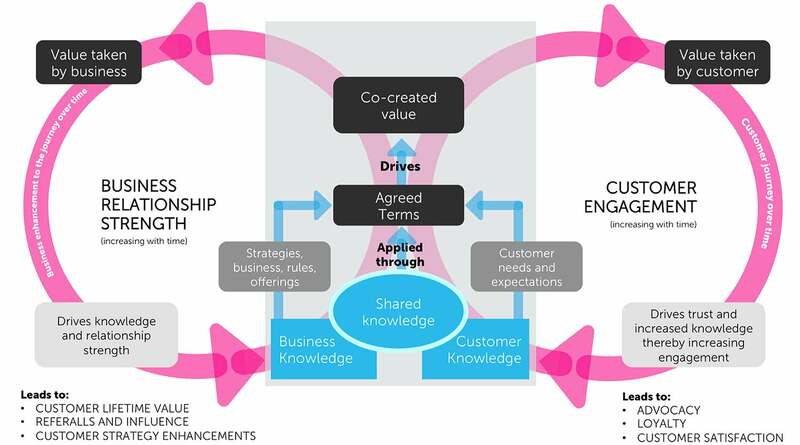 To repair broken relationships, businesses need to work to establish common knowledge between customers and the organization. Also, businesses need to work build that ever-precious, terribly fragile feeling of trust with their consumers. Knowledge and trust will result in greater customer engagement and stronger business relationships, according to the Thunderhead analysis. An infographic summarizing this relationship is available below. To win customers' favor, businesses need to always keep in mind three fundamental principles in their interactions: be consistent, unselfish and think about the long term. While specific engagement techniques will depend on the industry, there are some through lines that should drive your communication strategy with your customers. In particular, customers in any industry get frustrated when they interact with one part of a company, relate personal information, and then have to repeat that same personal information when they interact with another branch or silo of the company. “The larger the business, the more likely this is to be the case. The result is a highly fragmented experience for the customer,” the report says. Ensure that customer information you may have on file is accessible to anyone who might be interacting with customers. Also, every interaction your company has with a customer -- especially over social media -- is easily available, transparent and traceable. Learn from that data. One option for improving customer relations is to develop “customer champions” within your company. These are teams of employees with access to all historic and real time data about all customers across all departments and all channels of communication. Their sole priority it is to put the customer first and improve relationships.